Schwab Retirement Technologies (Schwab RT) is delighted to introduce a more engaging and accessible web experience for retirement plan participants. 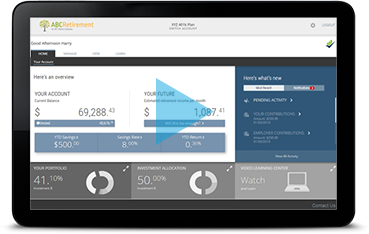 Our newly redesigned participant website has a clean and responsive layout that helps participants clearly see their personal retirement journey. Designed around simplicity, the new site puts key information such as account balances and projected income front and center. Simple charts seek to make portfolios more understandable, and participants who want more can click through to see deeper levels of detail. The responsive design means that participants can view and manage their accounts from any device, including tablets and smartphones. Schwab RT’s new participant website provides what our clients’ plan participants have been asking for: a simpler experience that makes it easy to find the information they need. The new site has completed pilot testing successfully and is now available to all Schwab RT clients. We have created a brief video to introduce plan participants to the new site. Click on the image* below to watch. *Images are hypothetical and for example only. The Charles Schwab Corporation provides services to retirement plans and participants through its separate but affiliated subsidiaries: Charles Schwab & Co., Inc., Charles Schwab Bank, Charles Schwab Trust Bank, Schwab Retirement Plan Services, Inc., and Schwab Retirement Technologies, Inc.® (Schwab RT). Schwab RT is engaged in developing and licensing proprietary retirement plan recordkeeping systems to independent Third Party Administrators.